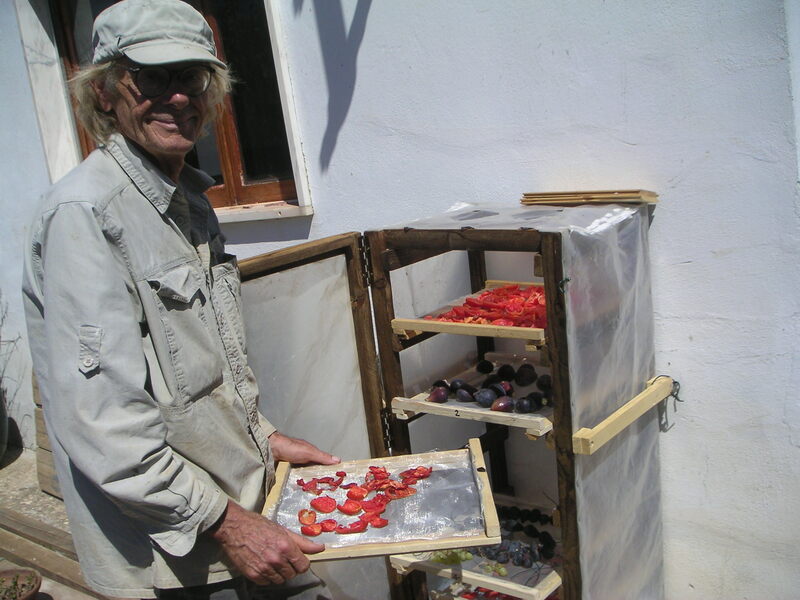 Drying is an excellent way to store fruit and vegetables for later use and it can be done in a simple home made solar dryer. Dried tomatoes are delicious and have a high amount of bioavailable lycopene, an antioxidant 100 times more efficient than vitamin E. Having our own dried produce also means that we know for certain that our raisins, dried figs and tomatoes are grown naturally and without any chemicals. 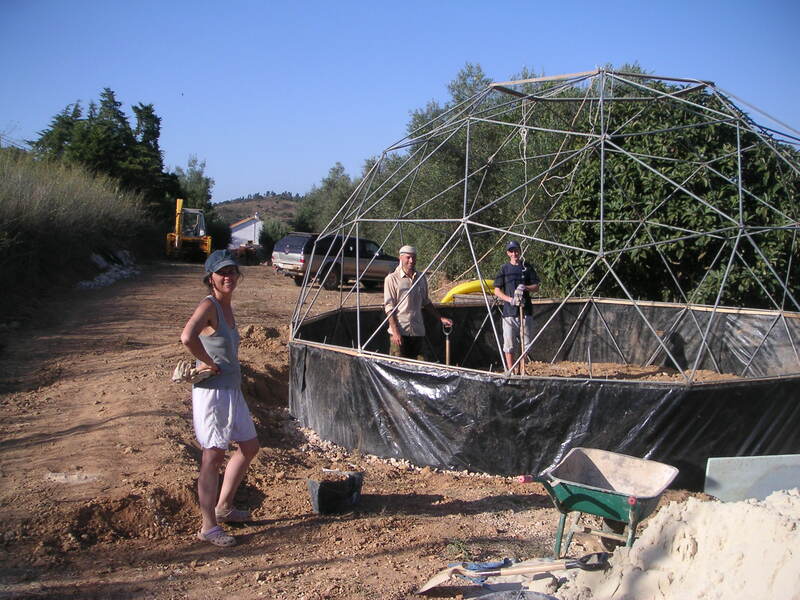 The new dome structure is assembled and today Natália and João went back home as their holiday has ended. Meanwhile two new participants arrived and we completed filling the ditch with gravel and earth with the help of these new friends. In the picture with Luisa, at left Marco from Belgium who passed by to have a look and is still looking. And at right Klavs from Latvia who intends to stay untill next spring. 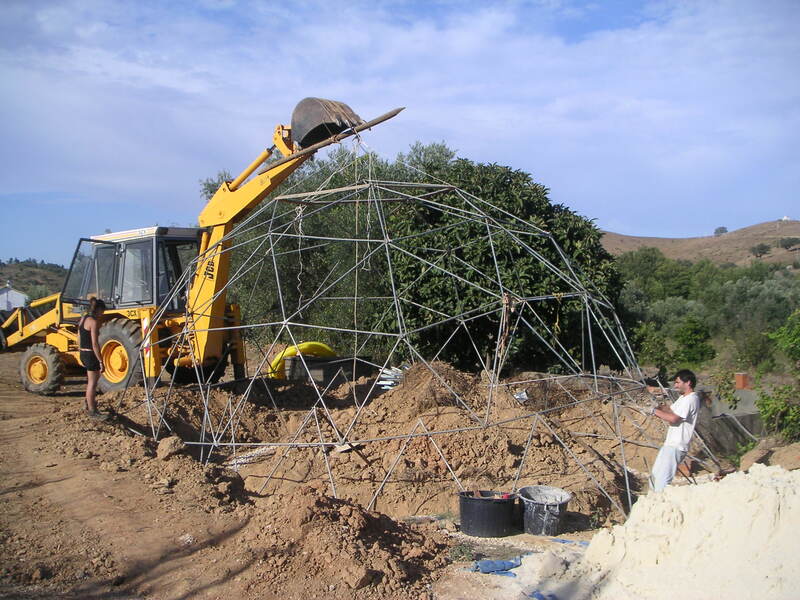 Our new dome is a 3V Icosahedron. There is no half dome of this type, you can choose a 4/9th or a 5/9th dome. We assembled the fifth section and the existing 4/9th part needed to be connected on top of this with 15 bolts. We were worried about how to lift 120 kgs and keep it suspended in the air during the operation. João looked at the excavator. Yes, just the right job for her! 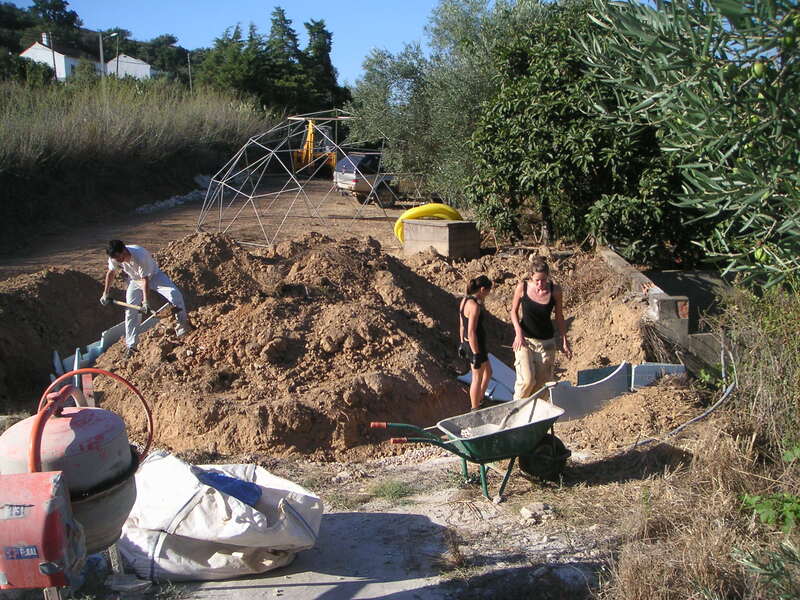 This big round ditch with a drainage tube, the combined effort of Cornelia, me and the excavator is filled again with the help of Natália and João (from Portugal, arrived today), with gravel over the tube. We are preparing for the winter. Expect some heavy rains creating muddy conditions on the clay soil. The drainage will help to keep the construction materials dry that we want to store in the 7 meter dome. 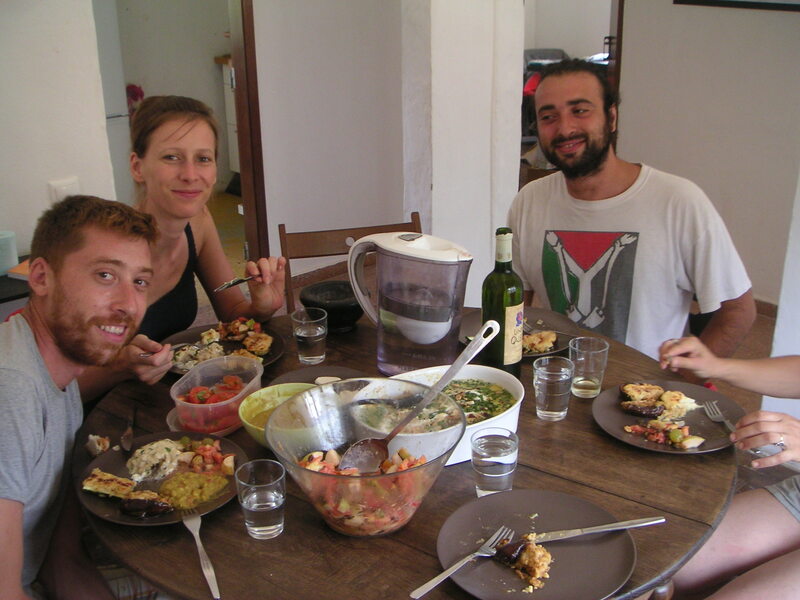 Cornelia who arrived from Austria this week is now our temporary garden coordinator, Hussein from Spain (at right) our temporary Chef de Cuisine and David, at left, also from Spain is temporarily doing carpentry. But unfortunately only for relatively short stays. If you can and want to experience a different life for a longer term, and want to take responsibility for a part of our project, please get in touch. The International Rainbow Gathering 2011 attracts thousands of people. It takes place in Portugal and six Rainbow people came over to us yesterday. Just in time to carry our 7 meter dome to it’s new location in the parking area, where it will be used for keeping work materials dry during the coming winter season. 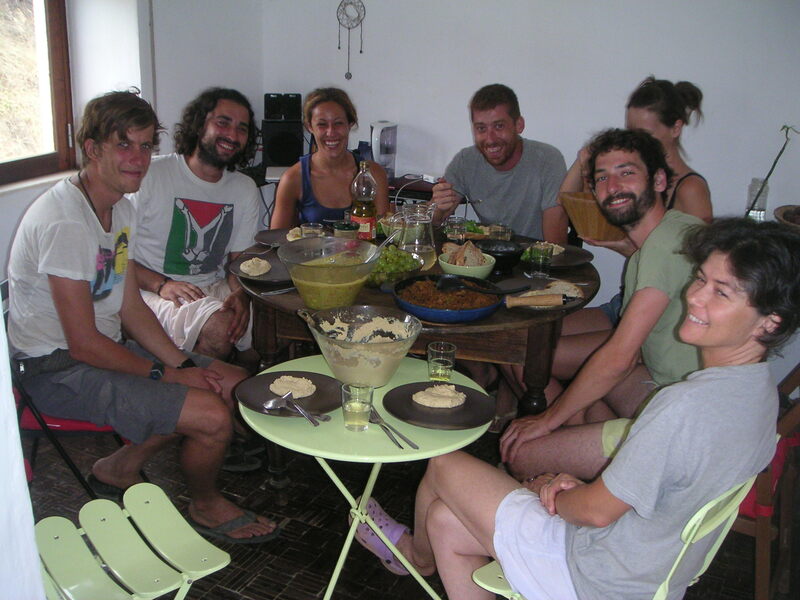 They also help us to finish other projects and their cooking skills resulted in a delicious lunch today. 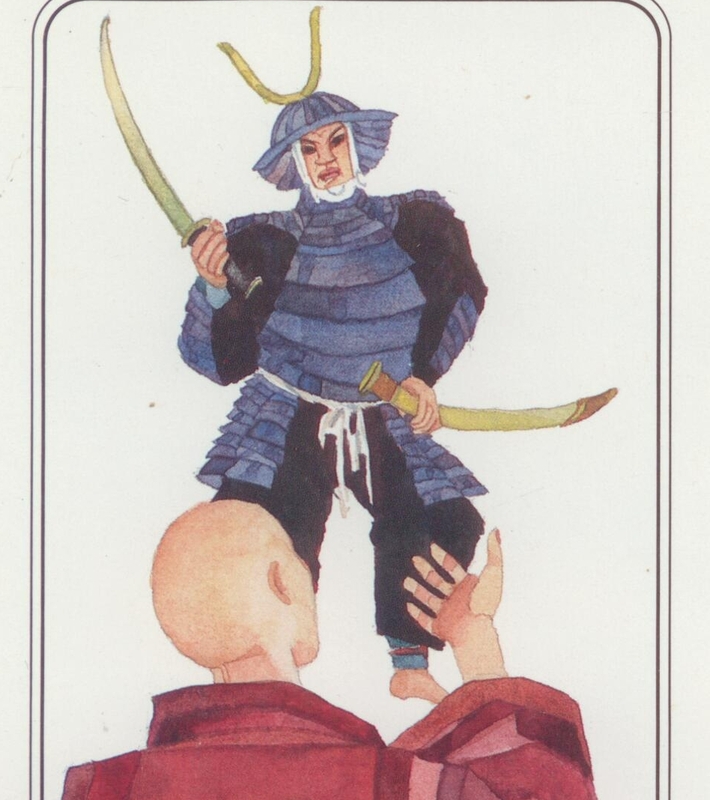 Our Osho Tarot card for today is about how our own choices create whether we live in heaven or hell. UK Prime Minister Cameron just explained that the world is in ‘a slow motion moral collapse. People are irresponsible, behaving as if their choices have no consequences’. He failed to mention those political and corporate leaders who are setting a bad example by choosing greed over social responsibility. He intends to ‘mend our broken society’ but it seems to be beyond repair. Osho says: Drop the old completely and give birth to the New Man, living in awareness, in meditation, in response-ability. This is what our community is about.